In keeping with our desire to highlight some of the research work that goes on within the Library walls, we asked writer Barbara Kent Lawrence to discuss her latest project, which was sparked by family history. It must be confessed that when Ms. Lawrence first contacted us, we were not sure that we had much that would be useful for her, but her research here turned into the kind of archival adventure that gladdens anyone with an historical turn of mind. More can be learned about Ms. Lawrence and her work through her website. 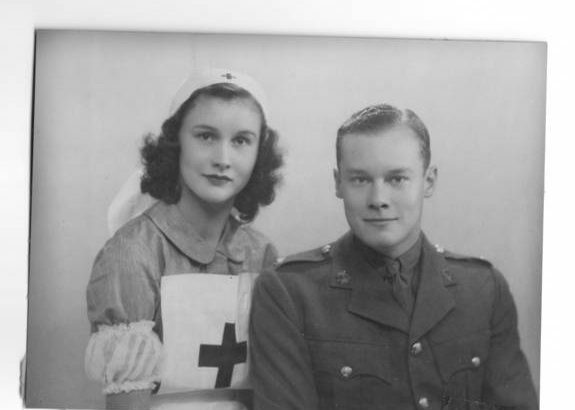 For the past two years I’ve been researching the lives of members of my British family during World War II. Although in many ways their experience was unique, it was also deeply connected to the culture and history of the period in which they lived. I hope to write about the period from 1936 – 1946 using their stories as a way to understand the larger story. An event drew me back to a moment and a particular artifact. Two years ago this fall, I searched for a project to do while I recovered from knee replacement surgery. I had long wondered about the photograph of my mother and uncle, which you can see below and I wanted to learn more about them when they were young. I knew my mother had won a scholarship to the Royal Academy of Dramatic Art when she was 15, was later discovered by Fox Films, made several films, and acted on the London stage. I now know that in this photograph she is wearing the uniform of a member of the Voluntary Aid Detachment, which was composed primarily of hastily trained young women who worked in hospitals and as ambulance drivers during the war. I’ve learned that she trained at Lambeth Hospital in London, was later assigned to Netherne Hospital near London, and finally worked at the temporary military hospital in the Croydon Aerodrome Hotel. All I knew about my uncle was that, according to my grandmother, he was very brave, he parachuted into France, and he was evacuated from the beach at Dunkirk. I’ve since learned that he joined the army nine days after Great Britain declared war, served with the Royal Army Service Corps, was sent to France with the British Emergency Forces in January 1940, and was, indeed, evacuated from Dunkirk at the end of May or early in June, 1940. He was not, however, a paratrooper, although he learned to parachute. He was assigned as liaison to the Airborne and worked at Syrencote House in Salisbury where much of the planning for D-Day was done, as well as, less frequently, with troops in the field. Copyright Barbara Kent Lawrence. Used with permission. The family story – told primarily by my grandmother, was that my mother was acting in London when Joe Kennedy Jr. came to see a play in which she was the heroine. He was smitten, and became “a stage door Johnny.” My mother said she went to the Embassy many times, got to know the family, and that the Ambassador helped her emigrate to the United States. But there the story ended. It ended, in part, because as children, we didn’t ask the questions I’m asking now. My mother died in 1973, and my grandmother and uncle died only a couple of years after that, so obviously I wish I had been more curious earlier! There have been so many turning points in this journey that I feel as if I’m negotiating a labyrinth. Fortunately, I found many helping hands that have pulled me around corners, routed me around barriers, and become allies and friends. I count the wonderful people at the Kennedy Library Research Center among them. One turning point came when after many days trying to find how my mother got to the United States, I finally realized that there must be a mistake in the way in which she was listed in the records. Instead of putting her name, age, place of birth, and so forth into the search requirements, I just wrote her name. Finally, after scrolling through what seemed like thousands of names, I found her: Barbara Greene, Warwick Castle, left Glasgow on January 15, 1941, arrived St. John, New Brunswick, Jan. 24, 1941, age 10. Age 10! That was wrong. She was 20 years and 10 months old, hence the problem. Someone had mistranscribed her age, which meant the computers had sifted her to the end of likely candidates in my search. Once I learned which ship my mother sailed aboard, I was able to find another passenger who remembers the voyage, though not my mother. I was also able to identify the people with whom she travelled, though I still have no idea why they were together. I’ve learned about the difficulties and dangers of the passage, and realized that the family story that she was escorting 15 children to safety in Canada is not true. She was not traveling Third Class as escorts did, instead she was on the Cabin or First Class deck, where there were only two unaccompanied minors. In addition, I learned that the Warwick Castle was requisitioned to take Lord Halifax to the United States after he was appointed ambassador here, but he and his party actually sailed aboard the battleship Georges V. Pretending Lord Halifax was aboard the Warwick Castle was a ruse, but because so few ships took civilian passengers, the government wanted to fill it with people who had registered to emigrate. From reading letters and diplomatic dispatches between Lord Halifax and Ambassador Kennedy at the Kennedy Library, I’ve learned that they were good friends, and it seems likely that Ambassador Kennedy helped my mother get passage aboard the ship. I was also able to find the Border Manifest made when she crossed the border from Canada into Maine. That document states Ambassador and Mrs. Joseph Kennedy sponsored her into the United States, as does the visa she applied for on October 29, 1940 and received the next day, shortly after Ambassador Kennedy left Great Britain on October 22. Other important turns – I’ve spent many days reading the papers of Ambassador Joseph Kennedy and members of the family. I found so much interesting material that it has been hard not to get sidetracked, but at first I found little that pertained to my mother and her relationship to the Kennedy family. One day, just after I got to what I was beginning to think of as “my” desk in the Research Room, I opened a file from the Joseph P. Kennedy collection and found a Pink sheet stating that a letter from Barbara Greene to Ambassador Kennedy dated June 28, 1940, had been taken out of the file and was “Closed in accordance with restrictions contained in the donors deed of gift.” I asked the reference technician, Michael Desmond, if I could see it, and he and archivist Stephen Plotkin conferred with the Chief Archivist. After what seemed a long time Stephen gave the letter to me. As I recognized my mother’s hand writing, though I tried very hard not to cry, I did. I was holding a letter from my 20 year old mother thanking the Ambassador for lunch and telling him that she was in love with his son. Although that letter confirmed that my mother cared about Joe Kennedy Jr., it is also is important to me because handwritten on the top right corner of the letter is the address of the hospital where she was working: Netherne, in Coulsdon. 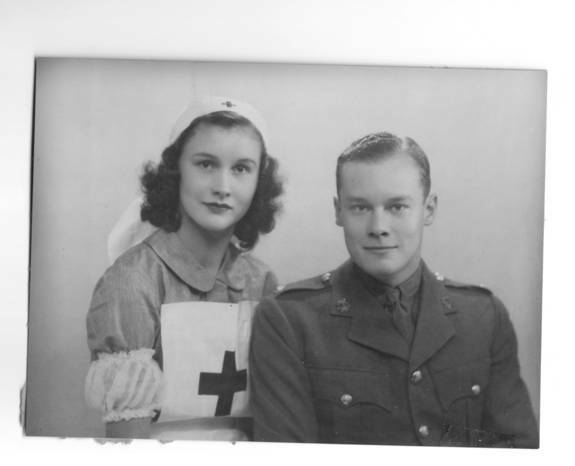 Knowing she was at that hospital in June, 1940 helped the British Red Cross find a document that tells me when she joined the VAD, and when she was assigned to Netherne. There is no record that she served in Lambeth Hospital, or anywhere else. However, newspaper stories written later about her piloting a Piper Cub around the eastern US to raise money for Bundles for Britain state she trained at Lambeth. In addition, those stories suggest she also was assigned to the temporary military clinic at the Croydon Aerodrome Hotel, and it may have been there that she was near an exploding bomb that destroyed most of her hearing in one ear. I also found a letter from my grandmother to the Ambassador, thanking him for flowers he sent her in August, 1940 when she was in the hospital, and a telegram from my mother to Mr. Kennedy sent just after Joe Jr. died. My mother was married by that time, and I was a year old, but she still loved Joe. Very recently I came across a letter my mother wrote Ambassador Kennedy in 1958 when she had remarried and was living in Washington DC. She was raising money for The Children’s Hearing and Speech Center and hoped the Joseph Kennedy Jr. Foundation would contribute. Ambassador Kennedy turned down her request, but wrote that he “was very pleased to receive your letter and very interested in the work that you are doing.” He ended the letter by saying “that when I do get to [Washington], I will telephone you, as I would love to chat.” I’ve also found that my mother was on the committee raising money for the Joseph P. Kennedy, Jr. Foundation, and that a few years after she was widowed in 1967, she hosted a radio show for the Kennedy Center until she died in 1973. Though I have learned much, I will be going back to the Research Room. I still need to search through newspaper clippings and photographs for evidence that Joe Jr. met my mother when she was in a play, and perhaps of their relationship. I’m going to England in March to see places where my mother, uncle and grandparents lived, and to meet cousins. I’ll also meet people who have helped me in my research and visit places including the Royal Academy of Dramatic Art, The British Film Institute, Syrencote House, and Netherne Hospital.